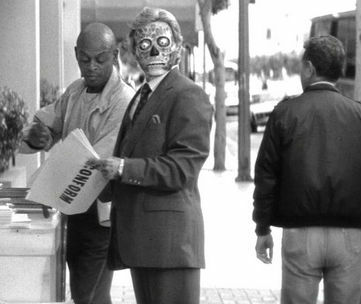 'They Live' is a 1988 American science fiction horror film written and directed by John Carpenter. 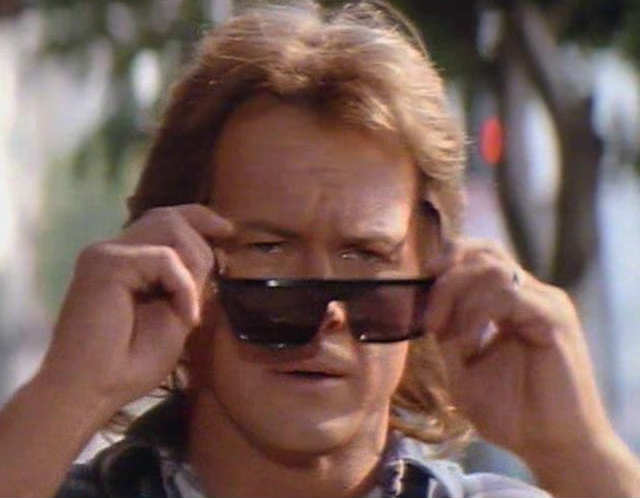 The film stars Roddy Piper, Keith David and Meg Foster. It follows a nameless drifter (called "John Nada" in the credits), who discovers the ruling class are in fact concealing their appearance and manipulating people to spend money, breed, and accept the status quo with subliminal messages in mass media. Based on Ray Nelson’s short story Eight O’Clock in the Morning, the movie is one of those rare subversive stories that forces viewers to question their world and their surroundings. A preacher’s description of the "masters" is applicable to the Illuminati. Seeking shelter Nada enters an empty church and discovers a hidden box. In an alley, he opens the box and finds dozens of sunglasses. Taking one, he hides the box of remaining sunglasses in a garbage can. Nada discovers the sunglasses have unique properties. After putting on a pair, he sees the world as it really is and discovers that it is not what it seems. Media and advertising hide constant subliminal totalitarian commands to obey and conform. When viewing those of wealth and authority Nada discovers they're not human. In Control Aren't Really Human! When he has his sunglasses on, Nada sees through the smoke and mirrors projected by advertisement and mass media. He only sees the core of their message and the only reason why they exist. No matter which magazine Nada flips open, he sees the same subliminal messages, which tells a lot about the true function of "celebrity" and "fashion" magazines. Despite the fact that they are all different, they all ultimately serve the same purpose: To reinforce messages from the elite to the masses. There’s the world we see (or are made to see) and then there’s the one we sense (and occasionally catch a glimpse of), the latter of which is a far cry from the propaganda-driven reality manufactured by the government and its corporate sponsors, including the media. Indeed, what most people perceive as life in a privileged, progressive and free society — is a far cry from reality, where economic inequality is growing, real agendas and real power are buried beneath layers of Orwellian doublespeak and corporate obfuscation, and "freedom," such that it is, is meted out in small, legalistic doses by militarized police armed to the teeth.